What can we learn from Snapchat and Facebook to form new habits? There used to be a time where newspapers created daily habits. Let’s figure out how to do that in the digital world. To build a habit forming product we need to understand user behavior and their emotions. Nir Eyal, author of Hooked, explains in his book that it is crucial to understand what can trigger certain behavior in life to make return consumption more likely. This methodology to create better products also applies to newspapers. Publishers need to grasp why Facebook, Google and the likes, are so much better at building addictive audience behavior in the digital era. In the coming weeks we want to elaborate on how those habits are being built, how to trigger them and in the end go in-depth with a practical case study. “Do we need more news addicts?“, asks Adam Thomas in his Medium post. He draws from experience during the pre-election time in the US when readers refreshed news sites and checked blogs constantly. He wonders what that next generation of news company could look like that can generate those user cravings for not just for a short period but be sustainable in it. Adam Thomas looks into Nir Eyal’s framework specifically and we will elaborate further on it. A trigger is responsible for a behavior, it initializes an action. Nir Eyal differentiates between two types of triggers: internal and external. External triggers, such as e-mails or push notifications, help to form habits. Internal triggers attach to existing behavior and emotions; think of automatically checking Facebook or getting your newspaper out of your mailbox in the morning. An Action follows a trigger. An action is facilitated by good usability design. This increases the ease to follow through. An action example would be, clicking a link to an article on Twitter. The Hook Framework helps create a craving, a need for something. The element of Reward is what differentiates the Hook Framework from other feedback loops. Getting those shares and likes and retweets is what users crave for. It has become an automatic thing that has our endorphin levels go through the roof. This phase covers investments from the user. Sharing an article, the action of inviting friends to like something, to join an event are investments users make to improve their experience. Those commitments can help to make triggers more engaging. 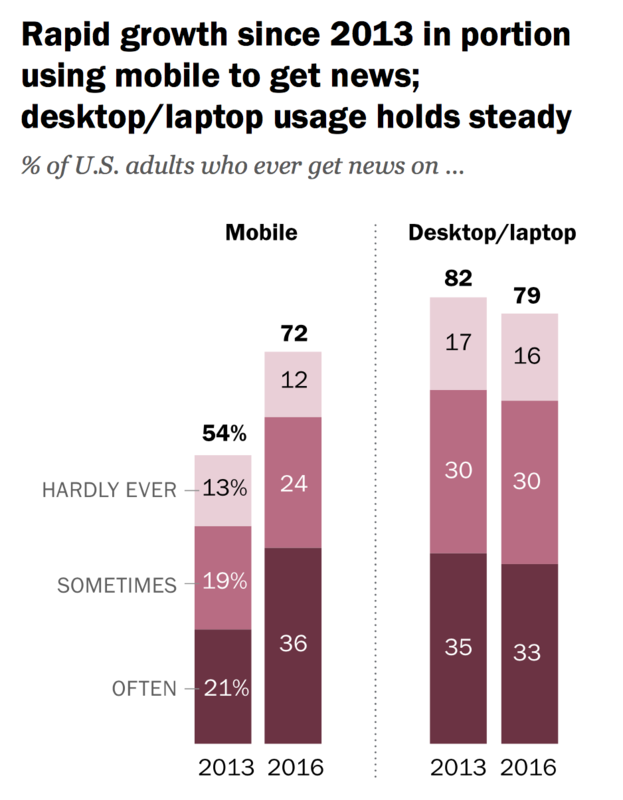 A recent study by Pew Research gives some insight in actions that facilitate behavior and in the end help form habits, in this case how mobile becomes the preferred device for news consumption. Surprisingly, mobile readers spend more engaged time on average with long-form articles than with short-form while getting about the same number of visitors. Publishers need to make it more comfortable and find easier ways to read long stories on small screens. Journalists have keep that in mind; for example, shorter paragraphs and subheads offer better navigation and facilitates readers’ focus. Interruptions of long form reading by incorporating different forms of media drive disengagement. To create a habit offering your stories on the right platform is essential; be where your reader is; and social media is where a large part of the audience is gathering their news from. About 6 in 10 Americans gets news from social media (However, only few trust social media as a credible source) but only few are heavily engaged with news. Which is evident if you look at the graph on the left. Now that we have established that habits are a crucial for long term success, we will look into how triggers can help to develop these habits next week. For further reading we recommend Nir Eyal’s book “Hooked – How to build habit forming products”, and this Medium post by Adam Thomas on whether we need more news addicts. For experimenting in your own company, we can recommend Ash Maurya’s problem interview methodology. This entry was posted in Industry news and tagged Reader behavior, Social Media. Bookmark the permalink.